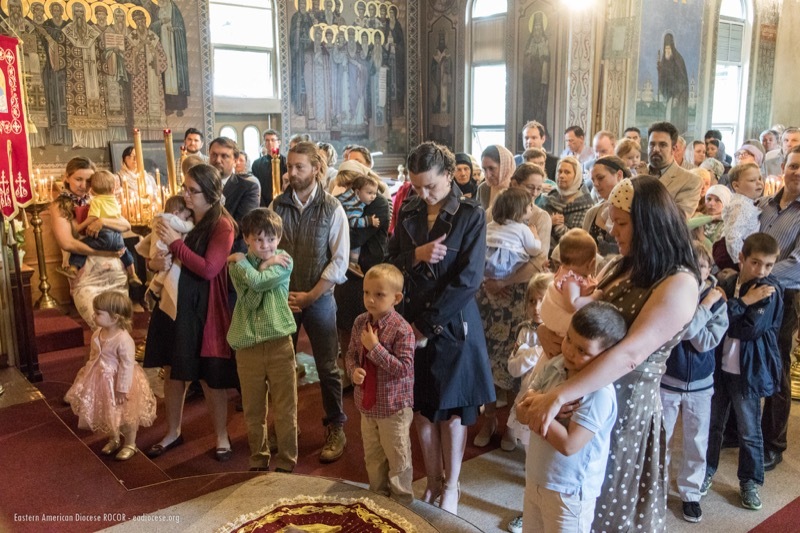 On Sunday, June 3, a joyous feast was held at Holy Dormition Convent "Novo-Diveevo" in Nanuet, NY. The feasts of the Meeting of the Vladimir Icon of the Mother of God and Sts. Constantine and Helen coincided with the Sunday of All Saints. The Vladimir Icon of the Theotokos housed in the convent’s main St. Seraphim Cathedral is especially revered, as it once belonged to the Optina Fathers. The founder of the monastery, Archbishop Andrei (Rymarenko) of Rockland, established the custom of performing a procession with the icon around the territory of the monastery. The Hierarchical Divine Liturgy was celebrated by Metropolitan Tikhon of All-America and Canada, Archbishop of Washington and Primate of the Orthodox Church in America, concelebrated by Metropolitan Hilarion of Eastern America & New York, First Hierarch of the Russian Church Outside of Russia (ROCOR), Bishop Irinej of Eastern America (Serbian Orthodox Church), and Vicar Bishop Nicholas of Manhattan (ROCOR Eastern American Diocese). The hierarchs were joined by Archpriest Alexander Fedorowski (cathedral dean), Archpriest Yaroslav Belikow and Abbot Photius (Oulanov; convent clerics); together with Protodeacons Jospeh Matusiak (secretary to Metropolitan Tikhon), Dimitri Temidis (cleric of Holy Virgin Protection Church in Nyack, NY), Serge Arlievsky (convent cleric), Leonid Roschko (cleric of St. Alexander Nevsky Diocesan Cathedral in Howell NJ) and Milos Zdralic (Financial Secretary, Serbian Diocese of Eastern America), as well as Deacon Nicholas Ilyin (convent cleric). Singing responses at Divine Liturgy was the Holy Prince Vladimir Youth Organization choir under the direction of Reader Adrian Fekula. At the conclusion of Liturgy, the procession began, with Fr. Alexander bringing the wonderworking Vladimir Icon of the Mother of God, blessing the buildings and cemetery of Novo-Diveevo. The procession concluded before the monument of the convent’s Heavenly patron. The celebration was centered on the blessing of the monument to Venerable Seraphim of Sarov. The monument was sculpted by A. Leonov and donated by the fund "Dialogue of Culture – United World" under the direction of Yuri Sandulov and the Consulate General of the Russian Federation in New York. It was presented with the aim of strengthening the spiritual ties between the Moscow Patriarchate and ROCOR, as well as cultural ties between Russia and the United States. The monument was installed near the entrance to the convent’s main Cathedral of Saint Seraphim of Sarov, in which an icon of the Vladimir Mother of God—a gift to the convent’s founder, the late Bishop Andrei of Rockland, from Elder Nektarios of Russia’s Optina Pustyn Monastery—as well as two icons of Christ that had belonged to Tsar Nicholas II and a cross from the Ipatiev House in Ekaterinburg, where the members of Russia’s last royal family were martyred, are enshrined. The Consul General of the Russian Federation in New York, Sergey K. Ovsyannikov, delivered greetings and remarks from the Russian Ambassador to the United States, Anatoly I. Antonov, emphasizing the importance of spreading cultural and spiritual values of Russia in the New World. A festal picnic luncheon was held for all on the grounds of the monastery following the consecration. Later that evening, a gala reception was held in the Consulate General of the Russian Federation in New York culminating the joyous occasion. Located an hour north of New York City on over 40 acres of land, the convent was founded in October 1949. The convent’s name—“Novo-Diveevo”—recalls the Diveevo Women’s Monastery in Russia that was closely associated with Saint Seraphim during his lifetime. During the Soviet era, the monastery had been closed and desecrated, while its nuns were driven out, exiled, and martyred. It was subsequently returned to the Church and fully restored. Novo-Diveevo was established in an effort to preserve the living memory and tradition of Saint Seraphim and Diveevo. Over the years, the convent has been home to many nuns from various parts of the world. The convent is home to many sacred icons artifacts, among which is a full length portrait of Saint Seraphim painted during his lifetime. Photos: G. Konyev (ROCOR Eastern American Diocese).